Eaton junior Hunter Frost drives to the basket during the Eagles basketball game with visiting National Trail on Saturday, Feb. 2. Eaton rallied late, but came up short 67-58. 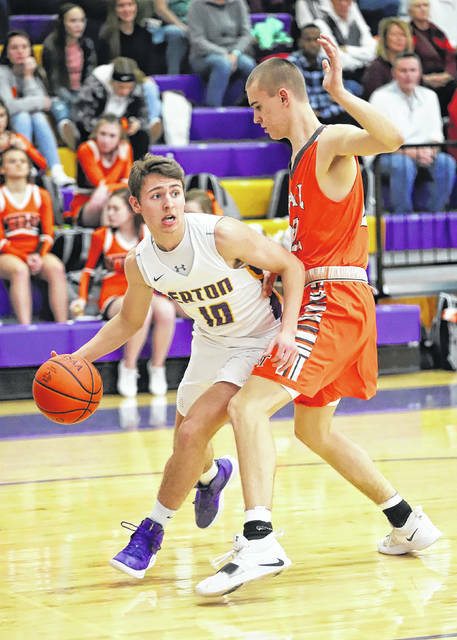 EATON — Eaton’s boys’ basketball team held Bellbrook to just 38 points on Bellbrook’s home court to pick up a 48-38 win. The game was held on Friday, Feb. 1. Both teams played even in the first half as Eaton trailed by two points at the break, 17-15. 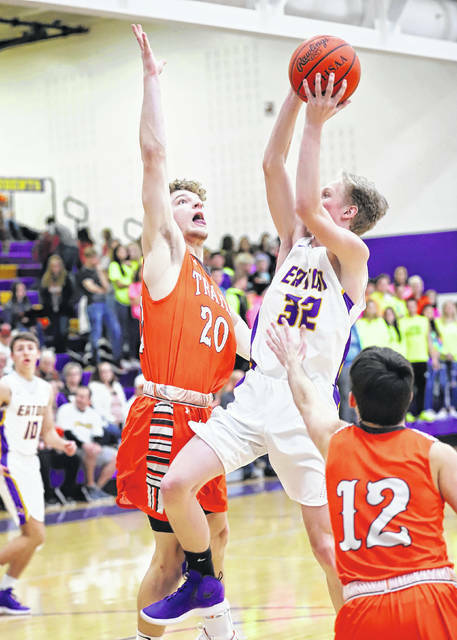 After a slow start to open the second half, Eaton came back and took control of the game in the third quarter. The Eagles outscored Bellbrook 19-11 in the period. “Great win for us,” coach Denny Shepherd said. “We played well through the game. Got down a little in the third quarter, but fought back. Baumann and Frost led the team with 14 points each, while Travis Pittman also reached double-figures with 10 points. Baumann also pulled down five rebounds. Dylan Jackson led the team with six rebounds and also had two assists. Howard led the team with five assists. The Southwestern Buckeye League win pushed the Eagles record to 3-7 in the SWBL’s Southwestern Division. Brookville is on top of the standings at 7-2, followed by Oakwood (6-3) and Monroe (6-4). 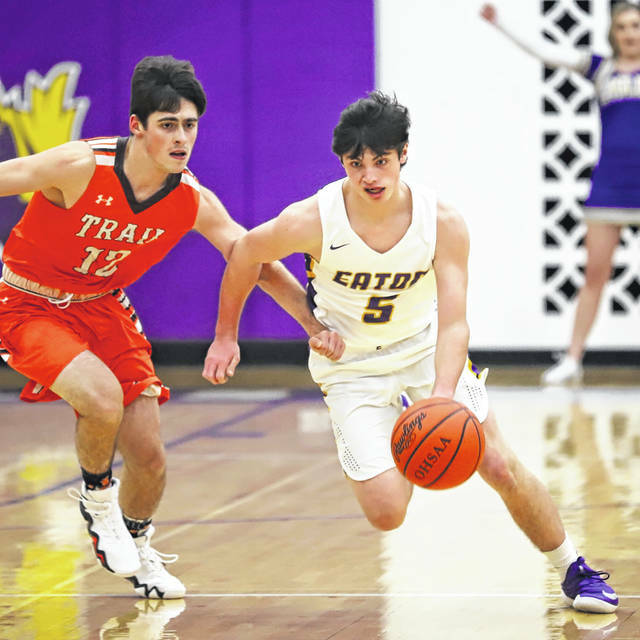 On Saturday, Eaton hosted National Trail and suffered a 67-58 setback. The Eagles (5-14) was scheduled to play at Franklin on Tuesday, Feb. 5 and will host Valley View on Friday for Senior Night. 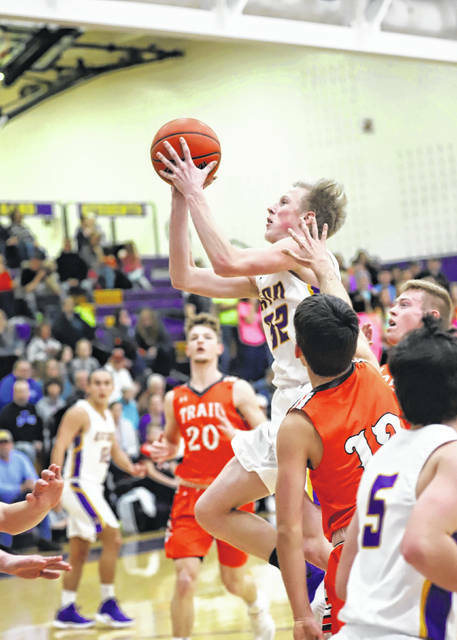 They will close out the regular season with a trip to Talawanda on Tuesday, Feb. 12.
https://www.registerherald.com/wp-content/uploads/sites/41/2019/02/web1_EHS-NT-1.jpgEaton junior Hunter Frost drives to the basket during the Eagles basketball game with visiting National Trail on Saturday, Feb. 2. Eaton rallied late, but came up short 67-58.